Pyongyang has fulfilled preparations for a missile strike in the direction of Guam, the North Korean embassy's charge d'affaires, Jin Jong Hyop, revealed in an interview with Sputnik last Tuesday; according to Sputnik contributor Andrei Kots, the target chosen by Pyongyang is an especially significant one. "One of the most powerful and fortified military bases of the Pentagon is located in Guam," Kots writes. "Its destruction could dramatically change the balance of power in the region." Guam is an island territory of the United States situated in Micronesia in the western Pacific Ocean and home to two US major military installations: the Andersen Air Force Base and the Naval Base Guam located in Apra Harbor, a deepwater port on the western side of the island. The journalist pointed out that the military facilities are regarded as the Pentagon's main "muscles" in the Pacific region. The Andersen Air Force Base houses long-range bombers and missile carrier aircraft capable of delivering nuclear weapons. The infrastructure of the air base allows the US Air Force to deploy aircraft of any class, including modern B-52, B-1 Lancer and B-2 Spirit strategic bombers, as well as fighter jets, Airborne Warning and Control System (AWACS) aircraft and others. According to some reports, six B-1B aircraft are currently on station on Guam; however, if necessary, the air group can be increased in a matter of days, Kots noted. "The US Air Force is able to conduct missile and bomb strikes against targets located along Eurasia's Pacific coast," the journalist pointed out. "To date, the main potential target of [US] 'strategists' located in Guam is the Democratic People's Republic of Korea (DPRK). But they also may pose a potential threat to two major geopolitical players in the region — Russia, and China." For its part, the Naval Base Guam is second only to Pearl Harbor in Hawaii and remains one of two major US Navy facilities in the Pacific Ocean, Kots remarked, adding that it is expected that up to 20,000 marines from Japan's Okinawa will move to the Guam naval base in the future. Although there is no exact data regarding the number and types of US vessels based at Apra Harbor, the US Navy reported in late October 2016 that the ballistic missile submarine the USS Pennsylvania (SSBN 735) visited it for a scheduled port visit on October 31. In addition, Los Angeles (SSN 688)-class fast attack submarines regularly patrol the region. However, the Guam military base is not the Pentagon's only foothold in the region aimed at keeping an eye on China, North Korea and Russia, the journalist noted: mainland Japan and Okinawa are home to about 90 military facilities of the United States Forces Japan (USFJ) — an active subordinate unified command of the United States Pacific Command (USPACOM). Kots noted that Misawa Air Base located 425 mi (684 km) north of Tokyo deserves special attention since it is one of a few foreign airfields where the Americans station their advanced fifth-generation F-22 Raptor fighters on a rotational basis. "In general, the number and composition of military bases of the US Army, Air Force and the Navy in Japan indicate that the Pentagon views this country as a possible foothold for a potential military standoff with China, Russia and North Korea," the journalist surmised. But that is not all, the journalist notes: if one were to take a look at the largest US overseas military installations one would find out that one of them is located in Germany and another is situated in Qatar, to maintain control over the European theater and the Middle East, respectively. Kots pointed out that the Ramstein Air Base, in Rhineland-Palatinate, Germany, which serves as a headquarters for the United States Air Forces in Europe and a North Atlantic Treaty Organization (NATO) installation is the largest US military base in the European Union. "It is also home to 16 squadrons of military transport aircraft of the 86th Airlift Wing (86 AW)," the journalist wrote. "It is here where [US] troops and equipment are being dispatched to, to take part in countless joint military exercises in Eastern Europe and the Baltic region with their NATO allies." The US and German flags fly behind a sign at Ramstein Air Base, Germany. In addition, up to 150 nuclear weapons are stockpiled at this base, Korts highlighted. 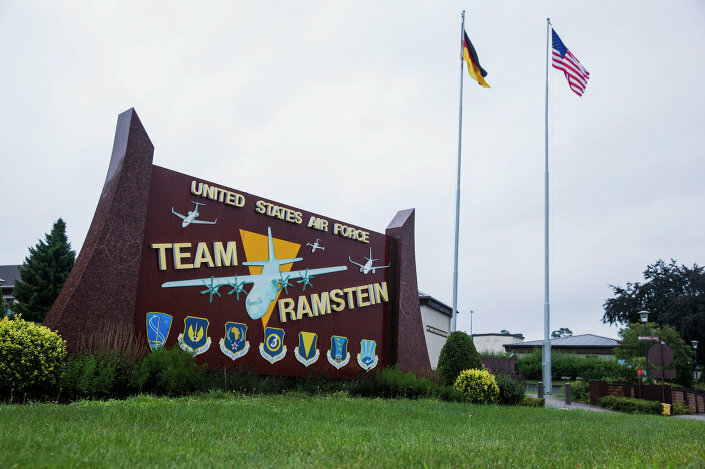 According to the journalist, the Ramstein Air Base would be used as a transit point for US-NATO troops and equipment and, possibly, a jump-up base for US strategic bombers in the event of a hypothetical conflict between Russia and the Western military bloc. Last but not least, the Al Udeid Air Base — a military base southwest of Doha, Qatar — is regarded as the most important US foothold in the Middle East. The United States Central Command and Air Forces Central Command are also residing there. Back in the 2000s, thousands of US troops, as well as 300 Abrams tanks, 400 Bradley Fighting Vehicles (BFV), self-propelled artillery and Patriot air defense systems, were deployed at the base, the journalist noted. More importantly, the Al Udeid Air Base boasts a 4,000-meter landing strip that could accept any type of aircraft, he underscored, adding that besides military transport aviation and refuelers, RC-135V/W Rivet Joint reconnaissance aircraft, EA-6B Prowler electronic warfare aircraft, US jet fighters, bombers and unmanned aerial vehicles (UAV) are also based there. "The Al Udeid Air Base is of the greatest importance among the other 35 US military facilities in the region," Kots emphasized. "It is from here that the actions of the US-led anti-terrorist coalition in Syria and Iraq are being coordinated from." Previously, the base played a significant role in the Pentagon's large-scale military campaigns in Iraq and Afghanistan. Currently, about 10,000 US troops are stationed in Al Udeid. In this houston military bases by state website everything related to that are found.Like the US Army controls an arms depot in central Texas. Just north of San Antonio, Camp Stanley (CSSA) is a storage activity center once called Camp Funston.